Cannabis oil has been used for thousands of years in traditional oriental medicine. The human body needs a few dozens of vitamins and minerals to attain to its full functionality. These nutrients can’t be manufactured cannot be produced by the body. La Vida Verde makes these nutrients available for consumption with these capsules. This is why Marijuana oil Capsules are very important for our body and Life. These Capsules provide best results if taken on an empty stomach and dosage could vary according to your age and physiology. 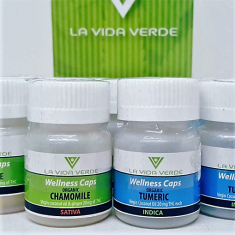 Take La Vida Verde Wellness Capsules before a meal and to achieve the maximum effect, which usually comes along with an arousing desire to eat. La Vida Verde is a company that always ensures that their products are engineered to the safest consumption standards. The ingredients used in producing these capsules are 100% organic. They contain no pesticide residuals or artificial additives. By focusing on using healthy fats, edibles absorb into your body more rapidly than the over processed sugar based edibles. All of our cannabis oil products are CO2 extracted. This product is tested for proper dosing, and manufactured adhering to the most stringent of standards, and abiding by FDA and USDA regulation. There wellness capsules are awesome!